LittleBone all-in-one fret file is our original concept and exclusive product. Beware of imitations. This All in One fret file is all that you need for recrowning any fret. It is good for renewing worn frets or reshaping after fret leveling. This is the simplified version of a more complex project based on alternative concepts of fret work. This model was designed with a unique abrasive base with the optimal operating angle and a compact shape that make it perfect for any skill level (further versions are coming soon). 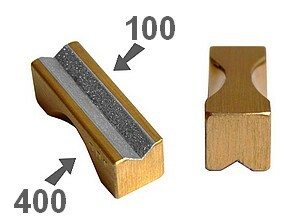 The abrasive surface is configured to work only where it is really necessary, absolutely not on the top of the fret. 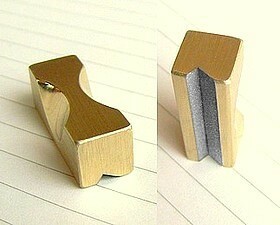 It saves your fret leveling and it can help to correct the intonation of your frets. Grit #400 is standard, which is enough since R.M. system has a very light touch and usually doesn't leave big edges on the fret. There is also the #150 grit version for heavy duty. LittleBone400 is also included in the Reload and Refinish Kit. ATTENTION: if you think to buy LittleBone for steel frets, please remember that its grit is not so different from the grit of the other diamond files. Diamond files are quite delicate and might not last like the others. Although, buyers report that LittleBone #150 and #100 grit are not bad on steel frets. #100 grit is sold under request. Easy and affordable. Classic version. #400 grit works well with our leveling system. It helps to reshape non heavy worn out frets. For reshaping after standard levelings and bad condition frets, #150 grit is recommended. Economy Shipping: No tracking code. No insurance. #150 grit for a more intense use. With double grit #400 + #150 for normal and heavy duty. With double angle for more initial crowning simulation. Available grits: #400 and #150. Many other files based on my concept will be out soon with the release of the new home page. Stay tuned!